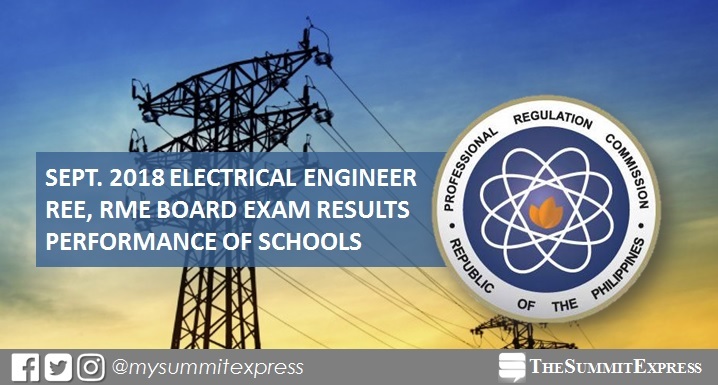 MANILA, Philippines – The Professional Regulation Commission (PRC) hailed the top performing schools in the September 2018 Registere Electrical Engineer (REE) and Registered Master Electrician (RME) board exam. University of Santo Tomas (UST) and University of Saint Louis - Tuguegarao (USL-T) tied on the top spot for REE board exam with 100% passing rate. Meanwhile, Polytechnic University of the Philippines (PUP) - Sto. Tomas led the schools in the RME board exam, 96.67%. PRC conducted the licensure exam in the cities of Manila, Baguio, Cagayan de Oro, Cebu, Davao, Iloilo, Legaspi, Lucena, Tacloban and Zamboanga on September 1 and 2 (REE) and September 3 (RME). In the September 2017 REE, University of Santo Tomas (UST) topped the schools with 98.67% or 74 out of 75 passed the test. It was followed by Polytechnic University of the Philippines (PUP) - Sto. Tomas with 96.36% or 53 out of 55 passed. In the RME exams, PUP-Sto. Tomas dominated the schools with 98.31% or 58 out of 59 successfully hurdled the exams. In the September 2016 REE, UST also led the schools with 98.48% or 65 out of 66 passed the tests. It was followed by De La Salle University (DLSU) - Lipa with 92.00% or 69 out of 75 passed. For the RME, Technological University of the Philippines (TUP)- Manila topped the schools with 87.14%, 61 out of 60 passed. Monitor this page for the real-time updates on EE board exam results. Check out also the official website of PRC for more information.